According to some sources, it took the 36-year-old Anglican cleric Reginald Heber all of twenty minutes in 1819 to write "From Greenland's Icy Moun- tains"—a hymn that would go on from its initial composition in Wrexham, Wales, to become one of the most well known hymns in the British Empire and the nineteenth-century United States. As the story goes, Heber (1783-1826), who had won prizes for poetry writing in college and had even by then published a volume of poems and translations, was asked one evening by his father-in-law, the Vicar of Wrexham and Dean of St. Asaph, to write something to be sung the following day. Heber removed himself from company and, within twenty minutes, penned the song's four stanzas, the second of which Mahatma Gandhi would eventually call "clear libel on Indian humanity" and the third of which was printed on the illustrated magic lantern slide just acquired by P&PC and pictured above. The hymn was sung the next day—set, like the much older "A Famous Sea Fight Between Captain Ward and His Majesty's Ship the Rainbow," to the tune of the even older ballad "'Twas when the seas were roaring." 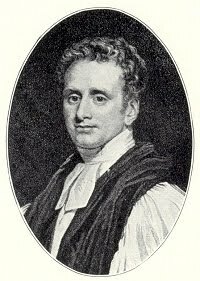 Four years later, in 1823, Heber (that's him pictured here) was appointed Bishop of Calcutta and would hold that post for three years, until 1826, when he died from a cerebral hemorrhage he suffered while taking a bath in Tamil Nadu, India. The Poetical Works of Reginald Heber was published in 1841, but Heber is most remembered for the hymns he wrote. As our new lantern slide perhaps suggests, "From Greenland's Icy Mountains" had wide circulation and appeal: it was (according to Wiki) the missionary hymn most frequently printed in nineteenth-century American hymnals; it was a particular favorite of the Methodists; it was included in the first Mormon hymnal in 1835; and it was still common enough in 1925 India for Gandhi to use it as a key point of reference in his argument against Christian missionaries who "come to India thinking that you come to a land of heathens, of idolators, of men who do not know God." 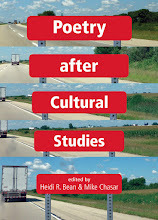 Because of their international circulation and appropriation, hymns like Heber's can frustrate narratives of national literature common to many English departments and poetry anthologies. It might be tempting, for example, to see "From Greenland's Icy Mountains" as a piece of British literature until one considers that, after its initial singing in Wales, it was (by one account) first published with music composed in 1823 by an American bank clerk and music teacher named Lowell Mason, who was living in Savannah, Georgia. Apparently, Mason wrote "Missionary Hymn" (his first published hymn tune) in just half an hour—a speed befitting Heber's own twenty-minute composition of the lyrics and making visible a pattern of fast writing (some might say "inspiration") that could make one wonder about the amount of care and reflection with which widespread Christian texts were created. When "From Greenland's Icy Mountains" is sung to Mason's tune, then, it's no longer just a British production, but a British-American hybrid. This type of cross-Atlantic collaboration isn't unique to Heber's hymn. When American poet Oliver Wendell Holmes wrote the poem that would get put to music as the hymn "Lord of all being, throned afar," for example, it would eventually move the other way across the ocean—from the U.S. to England—where it was printed on a magic lantern slide (a sort of projectable hymnal page, pictured here) that contained directions for singing. Holmes, who in 1859 imagined his Atlantic Monthly readers "singing (inwardly) this hymn to the Source of the light we all need," is only the starting point of a text that, like "From Greenland's Icy Mountains," got changed and hybridized as it was imported and exported around the globe. The lamp of life deny? But beyond that McLuhan-esque "medium is the message" analysis, what also got P&PC thinking is the content of the picture itself. Who are the missionaries? Where are they? Who are they preaching to? So, in hopes of finding some answers (we're no experts in religious history), we sent a picture of the slide to our old University of Iowa friend Everett Hamner, who now teaches at Western Illinois University where he studies the intersections of literature, science, religion, and technology. He in turn sent the picture to all of his religious history friends. And this is when things started to get even more interesting. So, the slide is possibly a British creation for British audiences imagining what missionaries at work in the Americas would look like. But when we factor in the British origin of Heber's hymn, its lyrics' emphasis on India and "Ceylon's isle" (in the stanza that Gandhi objected to), Heber's own connections to India, and the hymn's circulation in India and thus its role in the British imperial project more broadly, things get kind of complicated. Why aren't the American "Indians" pictured as the East Indians who would have been more on the minds of an English subject? Perhaps, in its need to picture "earth's remotest nation," the slide couldn't turn to India, because India was no longer remote enough a place in the British imagination. Or perhaps—and this is the most tantalizing possibility we've come up with—this slide (of a British hymn penned in Wales by a future Anglican missionary to India superimposed over a scene from the Americas) is a hybrid text like the hymns by Heber and Holmes eventually became. It's as if the British slide maker borrowed imagery from the Americas understanding that the British audiences for which it was intended would conceptually "set it to the tune" of British activity in India, in much the same way that Lowell Mason set Heber's words about Greenland, Africa, and India to music in Savannah, Georgia. We here at the P&PC office can't say for sure, and we'd love for someone out there to help shed some light on the matter. If you have any thoughts as you sit there in front of your computer—our age's version of the magic lantern's "holy light" and "lamp of life"—by all means please drop us a line.